At an earlier moment in my life, when I was learning the art of counseling, I remember being taught that laughter and tears often serve as signs that we’re getting close to our truth. I appreciated learning that. In an odd way, it took pressure off of either act — whether I was laughing or crying, I became more curious about what truth those emotions were pointing me toward. If you were in worship this past Sunday you saw me weeping at the altar. Depending on where you were sitting yourself and what you could see, that might have made more or less sense to you. I want to tell you what I saw and why it moved me to tears. Attempting to make sense of these scriptures with the children, I asked them if they’ve ever had guests come to stay with them in their home. They talked about play dates and babysitters and grandparents who’ve come for shorter and longer stays. We wondered if God might be like that, not walled off behind a distant future, but making a home with us here and now. As we sang the psalmody, one of our first time guests caught my eye. I’d never seen her before and only interacted with her briefly to welcome her when she came through the door right before worship. She was a middle-aged African-American woman and she seemed to me to be living with developmental delays, like my sister. I remember hoping that she would feel comfortable. Once we began to sing I watched as she turned in her seat to focus her attention on those of you playing instruments. Soon she was clapping her hands and swaying in time to the music, fully engaged and delighted by our worship. Later, as Jossy led the Prayers of the People, I watched as our guest mimicked Jossy, lifting her arms in prayer. With each petition she took one step closer to the ambo (the stand from which I preach and the lessons are read) until, at the end, she was nearly face to face with Jossy, who never lost her composure as she continued to lead our prayers. Finally, the woman laid her arms across the front of the ambo and rested her head on her arms, gazing up at Jossy with a look of open-hearted gentleness. When we passed the peace, you could feel the charge in the air. After a moving testimony by Gretchen Burch on the power of listening and presence to transform a brief encounter between her father and her husband into an opportunity for healing, followed by those prayers, there was an extra energy to the way you greeted one another, sharing hugs and handshakes. I had to almost yell to be heard over you, and you showed no sign of wanting to return to your seats. I wonder if this is something like what Peter felt, when he saw images from familiar scripture broken open and understood in a new way, on a new level, in his gut and his heart, and not just his head. All I know is that I could barely breathe, much less speak. All I could do is weep as I felt the truth of the gospel pour over me. And you held me just as you had held the visitor among us during the prayers, with open hearts and soft eyes and steady attention. One of you called out, “take your time” and another “we’re with you, Pastor.” Jossy laid her hands on my shoulders and took up the work of praying so that it was not just the elements being blessed, but me as well. Then we ate and celebrated God’s home among us. Afterwards you were so kind, checking in to make sure I was okay. Some of you seemed to intuit exactly what had been going on. It reminded me of the explanation of glossolalia my dad had given me when I was young. He told me that when the Spirit moves one to speak in tongues, another is sometimes gifted with a word of translation. It felt, to me, like that kind of experience — the Holy Spirit overflowing my ability to wrap words around it, and you translating what was seen and heard into words of love and compassion. That is the truth to which my tears were pointing. That God is love, and makes a home among us here and now. It wasn’t any more true this past Sunday than it is on any other given Sunday. I just perceived clearly for a moment a truth that on most days is so much harder to see and to remember. We are all that guest, and she is us, and together we are being made new. Earlier this year our Church Council met with members of the Strategic Listening Team to receive the preliminary report of the listening campaign they conducted with members of St. Luke’s. Most all of you took part in this campaign, sharing with one another what you love about our congregation, what you worry about when you consider our future, and how you tell the story of our mutual ministry. After a season of listening, we were all eager to hear what common themes might have emerged. We are Christian. We follow Jesus who loved all conditions of people, who rolled up his sleeves to engage the world, and revealed a better way to live. We gather weekly to be healed, recharged, and sent out to continue that work. We are accepting. Come as you are, inside and out. You are welcome here. We are progressive. We’re willing to confront “the way things are” and seek new answers to old questions. We believe ordinary people can do extraordinary things. We are active. We are committed to balance in life, compassion for the struggling, and engagement with the world. We’re imperfect but we’re determined to make a difference. We are community builders. We invite you to get to know our diverse members and friends, to find your place among us, and to join us in extending our hospitality to Logan Square and beyond. As I read that summary for the first time, I remember feeling my heart climb up into my throat as I recognized us in these words. Yes, we are welcoming, and yes, we are imperfect. Yes, we are progressive, and yes, we are Christians. Yes, Yes, Yes! There is a spirit of daring in the way you see yourselves, a spirit of adventure and openness to the future, that is simultaneously exciting and, if I’m being honest, terrifying. You are not play acting at faith, you are wrestling with God and one another and the world in which we live. You are trying to figure out how to be good parents, and good children, and good neighbors, and good colleagues, and good citizens, and good Christians. You are giving yourself to so many people, so many projects, so many causes. You are taking life one day at a time and figuring it out as you go. You are beautiful and inspiring. You must be so tired! “Render therefore unto Caesar the things which are Caesar’s; and unto God the things that are God’s.” (Matt. 22:21, KJV) That’s the King James translation, I just love the poetry of it. “Give therefore to the emperor the things that are the emperor’s, and to God the things that are God’s” is the translation we’re working with. Simple enough, right? Give this world what belongs to this world, and give God what belongs to God. Except that we know, with ears that have been conditioned to listen for puzzles and parables that the world does not divide so neatly into the things ruled by the powers and principalities of this world and the things ruled by God. We hear in Jesus’s dodgy response to the trap laid out by the Pharisees and the Herodians the ongoing call to struggle with how to be a good parent, a good child, a good neighbor, a good colleague, a good citizen, a good Christian. How much of myself am I prepared to give away? The question itself was a trap, of that much I’m sure. As one commentator on this scripture has written, “politically, just about the only thing Pharisees and Herodians have in common is that they don’t like Jesus.” As Jesus’s ministry grew, both factions were becoming more and more concerned with his waxing influence among the people. He was becoming a greater and greater threat to the delicate balance of power worked out between the emperor in Rome and the local leadership in government, in the Temple, and out in the countryside. They hoped to trap him with a question that would split his base, so they asked him about the topic that still so often splits us: they asked him about money. Here’s the trap. 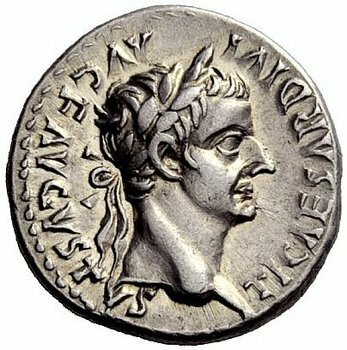 If Jesus says it is lawful to pay taxes then he is siding with the Herodians, the Jews who backed King Herod, the local ruler who was beholden to Rome for his power. He’ll lose the support of the poor, those oppressed and angry with the Roman occupation. On the other hand, if he encourages the crowd not to pay taxes he may keep their support, but he will be openly defying the empire and could then be tried, jailed, even executed. Either way, the Pharisees and the Herodians think they have Jesus neutralized. Often in the past, when I’ve considered this story I’ve put myself in the place of the crowd that followed Jesus, watching him take on the warring political factions of his day, hoping they wouldn’t trap him, cheering him on as he slips through their fingers. Over time though I sense that I, like most of us, am a Herodian or a Pharisee. I want Jesus to offer an authoritative answer that will either affirm my convictions or confirm that he is irrelevant. I want him to say something that will sound beautiful and righteous, that will seem laudable and impossible, so that I can recognize how right he is even as I let myself off the hook of living the life he calls me to live. Let him go to the cross for his glorious vision of a new heaven and a new earth, I’m just trying to get through the day in the heaven and earth we’ve got here and now. To say that Jesus slips through their trap isn’t quite right though. First of all, it doesn’t fit with who we know Jesus to be. He’s not afraid of conflict, or to speak his mind. He has already made his attitude toward wealth perfectly clear when he told the rich young man, “go, sell your possessions, and give the money to the poor, and you will have treasure in heaven; then come, follow me.” (Matt. 19:21) So why dodge this question? You know, it’s really only a dodge if you think it’s Jesus’s job to tell you how to live your life. It’s only a dodge if you think it’s a teacher’s job to do your thinking for you, or if you think it’s a parent’s job to solve your problems for you, or you think it’s a colleague’s job to do your work for you, or if you think it’s an elected official’s job to build your democracy for you, or if you think it’s a pastor’s job to be a Christian for you. But you don’t think these things, at least that’s not what I saw when I read the summary of the listening campaign’s findings. You don’t think our Christian faith is about having all the answers handed to you. You believe that following Jesus is a messy business that requires deep listening, respectful disagreement, careful discernment, and confidence that the God who called us together is with us each step of the way. This is one of the reasons we gather together as a church — to practice giving our testimony, to model what it looks like to say what we think, to listen to one another as we each work out what it means to follow Jesus in our lives and in the world. In this, you are a great encouragement to me. Your witness strengthens my faith on a daily basis as you give yourselves to the raising of your children in ways that nurture in them peace, love and compassion; as you support your spouses and care for your aging parents; as you devote yourselves to your work, your crafts, your art, your writing, your activism; as you engage with elected officials and community organizations to build the society you want to leave to those who follow us; as you offer yourselves to the life of this congregation and God’s church throughout the world. You do not divide the world into Caesar’s or God’s. Instead, you live with the awareness that each of us, you and me and even Caesar in all his manifestations, are part of the world God loves, and is reforming. As I celebrate eight years of ministry with and among you this week, I am so grateful for the spirit of daring and hope you have brought into my life. Together we have been living a life in which questions are answered with more questions, and the answers are only found when we are together and not divided. On this very day, June 1, 1900 St. Luke’s was established as a congregation of the General Council of the Evangelical Lutheran Church in North America, one of the many predecessor bodies that over time merged into what is now the ELCA. “The history of St. Luke’s Church began on Easter Sunday, April 22, 1898, when a Sunday School conducted by St. Peter’s Church held its first session in a vacant store located at the corner of Diversey and Washtenaw Avenues [which today is where the JFK crosses over Diversey, just north of Brentano School]. Lars Undem and J. Paulsen were in charge. In November, 1899, M. Edmund Haberland, a student at the Chicago Lutheran Seminary in Lakeview (located on the spot where Wrigley Field now stands), was called to develop a church in the area. He was still a student of the seminary and had only a limited about of time to devote to his work. But by persistent perseverance the work gradually grew and the confidence of the community was gained. The church’s founding charter was signed by Pastor Haberland and his wife, Verna; Louis and Sara Mueller; Andrew and Hannah Gusterine; August and Caroline Johnson; Wilhelmina and Andrew Lindblad; and Lars Undem — one of the adult Sunday School teachers from St. Peter’s that had kicked the whole thing off. That’s five couples and a single guy who, with the help of the wider church, went from a Sunday School class in a store front to the three-story church building that stands behind this sanctuary in just a couple of years. It’s amazing to think what just a handful of people were able to do together by the power of the Holy Spirit. I wonder what those early days were like. We know so little about these charter members. They’d been connected to another congregation, St. Peter’s Lutheran Church. They’d been active in an adult program of Christian Education together. Their pastor was a young man still in seminary. What made them want to start a new church together? 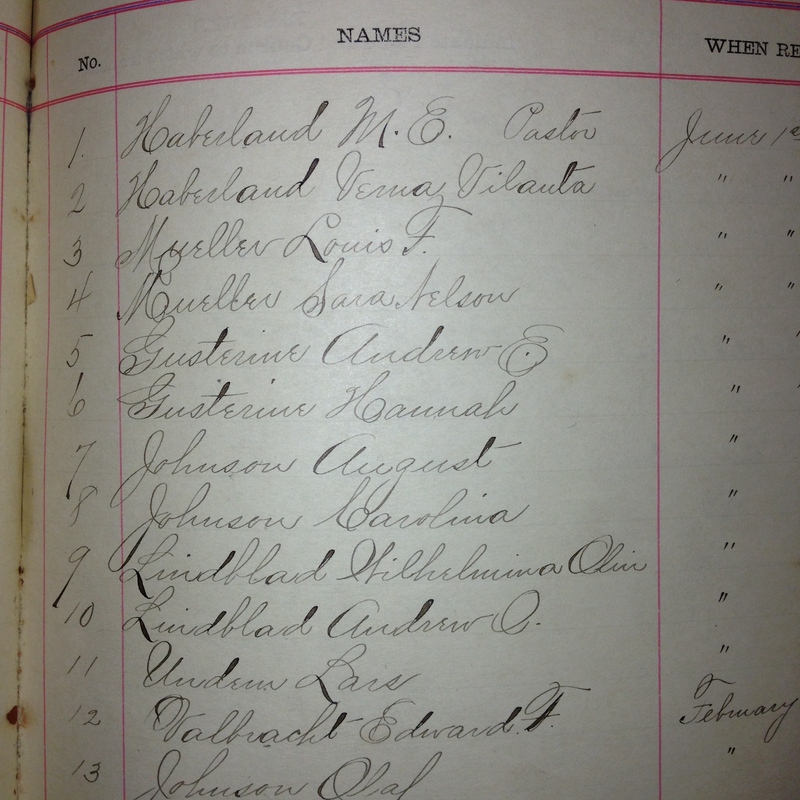 We can only guess, but there are clues scattered throughout the parish register. The neighborhood was full of congregations like Norwegian Lutheran Church (the Minnekirken) that still stands on the square, and other congregations that worshipped in Swedish or German. But this community founded itself as St. Luke’s English Evangelical Lutheran Church. Today the word “English” in this neighborhood might sound exclusionary, but in 1900 it signaled an openness to the children of immigrants from different parts of the world who spoke different languages and ate different foods, who had different traditions and customs. St. Luke’s picked a name that said, no matter which country your family originally came from, you are welcome here. This guess is supported by the names in the parish register: German names, like Haberland and Mueller; Scandinavian names, like Lindblad and Undem; Scotch-English names like Johnson. 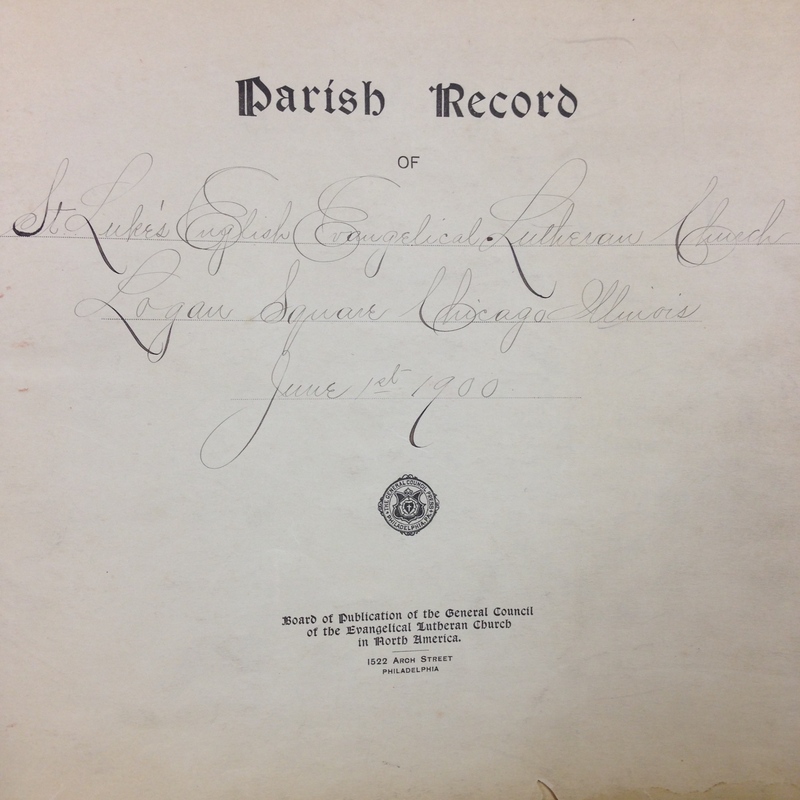 Parish Record, St. Luke’s English Evangelical Lutheran Church, ca. 1900. Apparently this openness to the diversity of the neighborhood was attractive to others, who quickly began to join the parish. The congregation grew from eleven to twenty in the first year, adding 31 people overall in the first year and a half. But not everyone stuck around. Early on, at least four members decided to go back to St. Peter’s, including Lars, the only single guy on the charter. We might speculate about why that was, but who can say for certain. It’s hard to be the one person in a small group who’s different from everyone else. The bachelor in a group of couples. The parents in a room full of childless young adults. Don’t be fooled, it’s hard work building community across lines of difference. There are about ten others whom the records indicate were “excluded by Council” within the first two years. Some of the entries say, “excluded by Council by request,” and others do not. Again, who can say what this means for sure, it might indicate that people who signed up early drifted away without giving anyone a reason, leaving it to the Council to decide that they were no longer interested. Or, it may be that there were disagreements about the direction the congregation was taking that resulted in a more active act of exclusion by the lay leaders. Who knows? There were certainly enough reasons for people to be coming and going. Folks who’d grown up in stable big steeple churches were in for something different, coming to a storefront on Diversey for Sunday School, devotions and prayer. A young pastor, not even fully trained, might have drawn younger families into the church, but alienated people who had decades of life experience on him and his wife. Then there was the challenge of generating the will and raising the funds to move not once, but twice, from Washtenaw to Rockwell and then finally to Francisco. Building a church, creating a community, takes a lot of hard work. Not everyone was up for it. I wonder how those early dozens would have heard the passage we read from First Peter, “Beloved, do not be surprised at the fiery ordeal that is taking place among you to test you, as though something strange were happening to you. But rejoice insofar as you are sharing Christ’s sufferings, so that you may also be glad and shout for joy when his glory is revealed” (1 Pet. 4:12-13). Obviously we have to be careful not to equate every suffering and struggle of our own with a sharing in Christ’s sufferings. Just because something is difficult does not mean it is a holy undertaking. Christ’s sufferings are the ones he willingly chose to take on so that the world as it is might be transformed into the world as God intended it to be. So, to the extent that the matriarchs and patriarchs of St. Luke’s understood that their struggle to create a place for people of all nationalities to gather around the means of grace, the table and the font and the Word of God, so that they could be strengthened in their faith and equipped to participate in God’s mission to restore the whole creation, their struggle might be remembered as a sharing in Christ’s sufferings. As they faced hard decisions together about whether their little adult forum could be something more, about whether or not this young seminarian had what it took to lead and care for them, about whether or not they could raise the money to build a chapel, about what language they would use in worship — their parents’ or their neighbors’, I wonder how they might have heard these words from the gospel of John, “And now I am no longer in the world, but they are in the world, and I am coming to you. Holy Father, protect them in your name that you have given me, so that they may be one, as we are one” (John 17:11). So many questions in front of them with no proof that any of their decisions would be the right ones, only faith that the God who had brought their families to these shores from many different places was the same God who spoke through Jesus to the disciples saying, “you will receive power when the Holy Spirit has come upon you; and you will be my witnesses in Jerusalem, in all Judea and Samaria, and to the ends of the earth” (Acts 1:8). Although, those words probably weren’t much comfort to the original disciples. Recall that their original question to Jesus had been, “Lord, is this the time when you will restore the kingdom to Israel?” (Acts 1:6). Those disciples had already been together a long time, they’d journeyed with Jesus through the course of his earthly ministry. They’d seen him heal the sick and cast out demons. They’d seen him confront the powers and principalities of this world. They’d seen him killed, but they’d also seen him raised from the dead. They’d seen all they needed to see to be convinced that God was in Jesus, and Jesus was in God, and that Jesus was with them, so they dared to hope that Jesus would do for them what they had been hoping for all along — that Jesus would finally restore things to they way they used to be, that he would restore the kingdom of Israel to its glory days. That is the temptation we face on Anniversary Sunday, especially this year, isn’t it? We too have seen God at work in this place. We too have stayed steady in our ministry to the sick, to those battling the demons of addiction and depression. We too have watched as the power of the Holy Spirit breathed new life into our dry bones, raising this church from a condition everyone around us expected would lead to death. We’ve seen all we need to see to be convinced that God is with us, and God is for us. So, as we gather this morning, this season, this moment in the life of our community after Easter, after the resurrection, we — like the original disciples — are drawn to ask, “Lord, is this the time when you will restore” things to the way they used to be, they way we remember them, or have chosen to remember them. And Jesus, full of the power and glory of the resurrection, does not tell them what they want to hear. He says, “it is not for you to know the times or periods that [God] has set … but you will receive power when the Holy Spirit has come upon you; and you will be my witnesses” (Acts 1:7-8). You will give your testimony to the power of God at work among you, and in the world, and you will carry this story out with you to all the ends of the earth. Out. Forward. Not back. Not knowing what else to do, “Peter and John, James and Andrew, Philip and Thomas, Bartholomew and Matthew, James son of Alphaeus, and Simon the Zealot, and Judas son of James … together with certain women, including Mary the mother of Jesus, as well as his brothers” (Acts 1:13-14) went home to Jerusalem and got together and prayed. That was the first act of the Acts of the Apostles who went on to build the church. They got together and prayed. Which, come to think about it was the first act of the founders of St. Luke’s, they got together at Washtenaw and Diversey and they prayed. Then they moved to a new site, and they prayed and worshipped some more. Then they moved to yet another new site, and they prayed and worshipped some more. And then, sounding an awful lot like the early church, they gave what they had for the sake of this new community they were building, and soon they had a place to gather with their neighbors, people from many lands with many languages. Peter writes, “Discipline yourselves, keep alert … and after you have suffered for a little while, the God of all grace, who called you to eternal glory through Jesus Christ, will fulfill, restore, strengthen and establish you. To God be the power forever and ever! Amen” (1 Pet. 5:8,10-11).